Osteoporosis Canada, Ontario Osteoporosis Strategy, University of Waterloo and GERAS Centre for Aging Research are excited to announce the launch of four series of videos, aimed at educating health care professionals to prevent falls and fractures for long-term care (LTC) residents. through consultations with LTC team members and experts. We gratefully acknowledge key collaborators on the development of the LTC Video series: Osteoporosis Canada, GERAS Centre for Aging Research, Ontario Osteoporosis Strategy, University of Waterloo, Hamilton Health Sciences, St. Peter’s Hospital, Extendicare, University Health Network, Schlegel Villages, Schlegel-UW Research Institute for Aging, St. Joseph’s Villa. 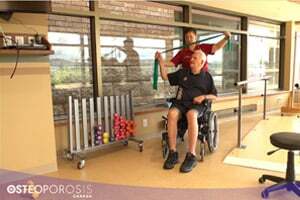 This series focuses on the role of physiotherapists and physiotherapy assistants for preventing falls and fractures in long term care by completing balance assessments and communicating with the team, doing balance and strength exercises with the resident, and involving their family members. Group exercise providers have a huge role to play in providing exercise to help prevent falls and fractures. This video series gives ideas for how to modify exercises for residents who can’t stand, working with residents with dementia or cognitive impairment, and incorporating postural exercises. The restorative care team can help prevent falls and fractures through practising spine sparing strategies, incorporating simple balance and strength exercises into walking programs, and providing postural cues through range of motion exercises. 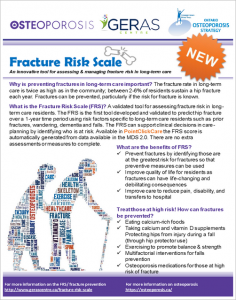 The new 2015 recommendations for fracture prevention in long-term care include an integrated falls and osteoporosis assessment as well as various treatment strategies. These recommendations target a specific population that is not usually considered in the development of treatment strategies and include valuable tools and resources for professionals providing care for long-term care residents.